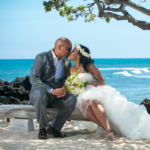 Wedding at the Four Seasons Resort Hualalai. The couple were married on North Beach, and had their getting ready photos done in their room. 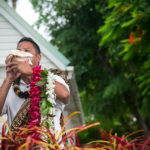 The couple and family and friends flew in from Hong Kong for their Hawaii wedding. There was a nice touch during the wedding when they brought out a tv during the ceremony to play a video of the bride’s parents who were not able to come to the wedding. They took photos after the ceremony around the resort including at the famous wedding tree.